You will soon meet two new members of the Crystal Pig Hunt Club, Gatlin Hawkins and Jordan Player. These guys just got done with a successful gator hunt right at the end of the season. 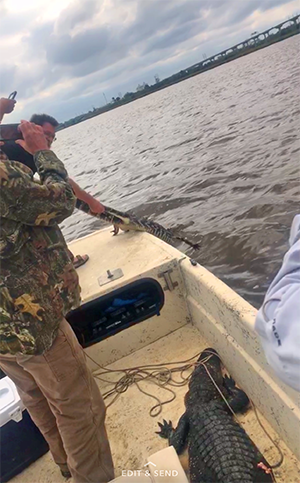 I know they got a ten foot gator but don’t have a final report. The photo was sent to my and you can see one in the boat and one being pulled in. Crystal Pig Hunt Club members have a major focus on deer but then we get sidetracked with hogs, gators, doves, turkey . . .
I’ll join the team end of this week for more setup work for the upcoming deer season. We’ve got some more stands to put out, supervise the bulldozing of the fire trail around the property and mowing and more mowing. Here’s to hoping for some cooler temperatures!